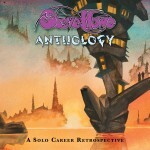 God bless you Steve Howe. I had the honour of meeting you and Chris a few times after shows in Chicago. Not only was Chris a brilliant bass player, he was very nice and funny too. You were very nice to me and signed some wildlife conservation cards for me. Chris is now in a celestial and luminous realm. God bless him too. Steve, Chris, Jon, Alan, and Rick (and the rest of the YES band members) make the bit in between so much better. Yes fans around the world, have been blessed by the inspirational music and thrilling live performances from arguably the greatest progressive rock band of all time.. Watching, listening to Chris and Steve on stage together was glorious. Thank you for a lifetime of emotion, music, love and memories. I have been playing Yes and Chris Squires music non-stop since I’d heard the news. The sharp and punchy bottom of Chris’ bass and Steve’s high-end guitar seem to glide around and through Chris’ bass. I will forever be appreciative of what you two had wrought, in the context of Yes. Nice words Steve, albeit Chris was naturally closer to his fellow band members than that of casual friends etc, as a musician myself (Drums) and a follower of the band, you will no doubt appreciate after years of attending various gigs, you guys have not only become friends, but are viewed more like extended family. That said the loss of Chris has hit me particularly hard after loosing my mother only a month previous. I therefore appreciate the grief everybody is going through and offer my sincere condolences to your good self, the Squire family, and all members of the band both past and present, alongside that of friends etc. May I affirm that Chris’s memory will live on in many peoples heart and minds, and hope this message finds you well. In closing, as a resident of Newton Abbot and likewise a customer of Soundpad, it was a pleasure to see you when you last played at Exeter Phoenix and briefly catch up with you for a few minutes. I hope to see you again soon, however in the meantime keep your chin up at this sad time. Sorry for your loss Steve. He was a GREAT Bass Player. Dear Steve, my condolences to you and all the family and close friends of Chris. As a Yes fan of 45 years, like so many, I have a great sense of loss, tempered by the truth that Chris’s memory will live on in Yes’s music, and in the great, wide trail of joy, beautiful music, and inspiration Chris has left for us. My thoughts are with you, Steve, on the loss of your good friend, Chris. Thank you Steve for creating all of your wonderful music that lifts our hearts and heals our souls. I unfortunately never got to see Chris Squire live. A lifelong Yes fan I call myself, I’ve seen plenty of other bands. I saw you Steve last year in Liverpool, we were a couple of rows back. I thoroughly enjoyed that. I also managed to see Jon Anderson but never all of you together. More fool me as I had plenty of chances and kept saying “next time”. Well, that has passed now as Chris has. My agony is but nothing compared to his family, wife and children. Rest in peace Chris Squire a musical master and one of my heros. My thoughts are with your family. Like Rick Wakeman said, an era has now passed. So sad for our loss, his family’s loss and every band member of Yes. Try to carry on through this difficult time. The music will live on and the legacy will stay inspired. It’s weird to say this, but I hope Yes can continue on. Listening to Yes erases all the troubles in peoples lives, although the band may have had some trouble making the music! When you consider their global impact, the daring nature of the music and their commercial success, they have to be the most successful band ever. And they’re still ahead of their time. I always wanted to say to them “thanks for all the great years of music…or maybe I should say ‘thanks for all the years of great music’ – the music was greater than the years were.” Chris, well, what else is there to say? Steve, I had been in my car listening to Sirius Sat radio and hear the tail ending of a YES song when all of a sudden the DJ said something about Chris passing. I couldn’t and didn’t want to believe it. I was in shock. I first saw all of you live in 1979 when I was 15 years old and have seen YES in concert a couple of dozen times since then. Both you and Chris have inspired me throughout my life with your masterful music. I feel so sad for your lose and my heart goes out to you, Chris’s family, Alan, Geoff, and Jon. May you find peace. Time is the healer of all. I will never forget Chris and hope to see you all at the concert in Brooklyn coming up at the Barclay Center. Desde todos los rincones de la Tierra, quienes hemos crecido amando a Yes y a su maravillosa música, nos unimos en estas horas para despedir a un amigo….el Señor Chris Squire. Queridísimo Steve, hermano nuestro en la música, Dios te bendiga, rezamos todos juntos y celebramos la vida, gracias totales. I´m very sad…Chris Squier was one of my heroes since my adolescence. Listening Yes I learned to appreciate the beauty of music. Remains the legacy, the wonderful music. RIP Chris and God bless you. Without any enough words to say, I just learned about the passing of Chris. Tears suddenly appeared, I just can’t help it. I had been following your unique music since I was a kid in the late 70’s, no matter how manny YES line-ups, it is always “musicianship” as a trademark. Now, as Rick Wakeman stated “An era just ended” and Like you also said, I can not imagine the future without Chris (or any of you guys). My deepest sympathies goes for you Steve, and Squire’s closer fellows and family. A part of my, just died too. What a sad time this is for everyone who loves Yes and Chris. My heart goes out to Chris’ family and all of Yes’ fans. The classic era was also my teenage years and somehow Chris’ passing has added another hue to those memeories. Since first seeing y’all on what I believe was your first American tour, opening for Jethro Tull, your music has given such joy. At that first concert, I’ll tell you, I was totally unprepared for what was about to come at me from the stage ; the power, the energy and the unique genius of the individuals. Watching Chris who looked like a giant from my floor seat, make his base do things I still remember to this day. Yours Is No Disgrace still jumps out at me like it was yesterday. Great fun. Later, the first time I heard And you and I, during the opening where he comes in with the 7 or eight base notes right after your 12 string intro simply blew me away. I still listen to and marvel at that time to this day and I cued it up once again when I heard of Chris’ passing. Thanks for this forum, for all the music and for playing so brilliantly with Chris. He’ll be sorely missed. I bought my first Rickenbacker bass because of 2 people. Chris Squire and Paul McCartney. What a tragic loss for not only the bass community but music in general. My heart goes out to the Squire family and to you Mr Howe for the loss of your dear friend. May you find comfort in knowing that the music the two of you created and played for all these years touched and inspired people like myself to pick up and learn an instrument. May you also find strength in your memories of Chris and keep his and your music alive. probably not but you must keep going and keep the wonderous music you have given to us going for the young ones coming behind…RIP chris..god bless you steve and all the other guys in the band you all have made my life a pleasure to look back on. and the love and hope it contains. Steve, you and Chris were in perfect harmony when you played together–both melodic, both technical, great bandmates, both great songwriters. Chris and every member of YES have left a musical legacy that is unparalleled. We had the pleasure last summer, August 23rd, of sitting in on your show in Lincoln California, outside of Sacramento. It was a typical California evening; weather in the 80’s, summer breeze and a nice crowd outdoors as the sun was setting. Stage was set for a great evening of music and the Yes did not disappoint. Chris Squire, Steve Howe, Alan White, Geoff Downes and young, talented Jon Davison just rocked. All you did was present Fragile and then Close to the Edge in the cleanest, most crisp, most poignant professional way that us old hippies and even the younger, screen addicted chatty younger gens really appreciated. The crowd ranged from kids to grannys and we cheered your encores … to the end. Seasons will pass us by…. we get up .. we get down. I too bought a Rickenbacker bass (the 4003 model) in part because of Chris Squire (jet black body with white pick guard- beautiful guitar!). I wound up selling the Ric to a fellow bandsman to concentrate on flute and saxophone for our band. Prior to that, I used the Ric in my Catholic Church group. On the Yes Years “rocumentary” Chris mentioned having been exposed to English church music, and I really related to that. As for you Steve, I met you and you signed my copy of “The Grand Scheme of Things” in 1993 at the now defunct Tower Records in Carle Place, Long Island New York, two doors down from my workplace. 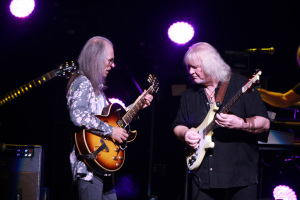 I also saw you with YES at the Jones Beach Theatre, also on Long Island. The high point of that show was your acoustic guitar work on the Topographic Oceans segment with Jon Anderson’s vocals. Thanks for all the great music and I’m deeply sorry for your loss.